We hope and pray you had a wonderful Easter/Resurrection Day! After a long and stressful week, we were looking forward to a nice, quiet day at home after Easter Sunday morning worship. 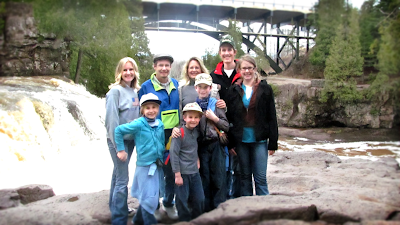 But we kids were surprised by Dad and Mom announcing they were taking us up to one of our favorite spots in Minnesota: Gooseberry Falls and the Northshore! 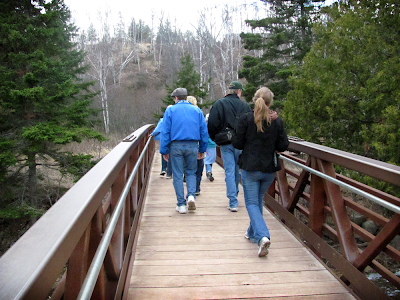 We hadn’t visited the Duluth area as sightseers since 2005, and since Sam, Jayme, and Caleb barely retained any memories from the trip, being so young, the most excited were Ben, Leesha, and I. But our excitement quickly rubbed off on them as we told them all about the beautiful scenery and memories. The LAs grabbed backpacks, binoculars, bird books, hankerchiefs, and Sam even brought a compass along. They were ready to go! The long trip was filled with lots of fun and laughter (as most trips are, praise the Lord! ), and we finally arrived at our destination. 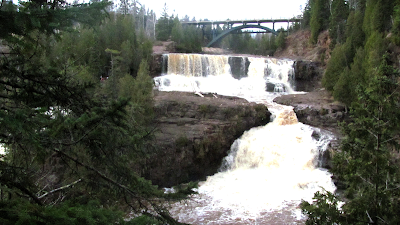 Gooseberry Falls is a gorgeous state park and highlights the natural waterfalls which cascade into Lake Superior, the largest freshwater lake in the world. The lower and middle falls. Walking around the park was good exercise! 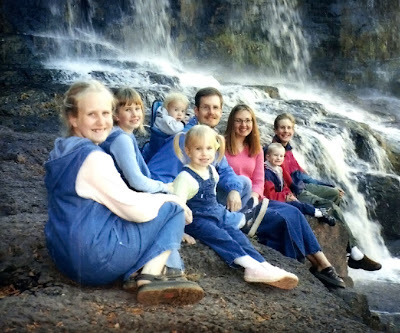 Most of the family (Mom’s taking the picture) at the falls in 2005. Look at Jayme’s pigtails! And baby Caleb! And the rest of us are so young! 2011 – my, how we’ve grown OLD! After our visit to the Falls, we stopped along the shore of Lake Superior, just to breathe in the fresh lake air and enjoy the peaceful surroundings of the mammoth lake. 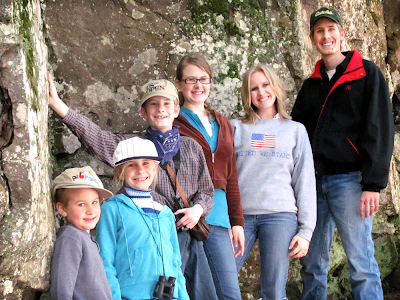 Most everyone found some special rocks (in fact, Mom spent most of her time rock hunting for agates! ), and of course, our cameras were busy taking pictures and video (unfortunately, I haven’t transferred my photos yet, so you just have to imagine the beauty!). The waves reminded us older ones of the Pacific Ocean in California, and made us all long to go on the “Great Adventure” again. Someday, Lord-willing! On the way back, we stopped for a non-traditional supper at our favorite restaurant, Arby’s. The irony of our stop is that, last Easter, our family made a trip up to Duluth to visit our foster sister in a hospital, and stopped at the very same Arby’s for supper! 🙂 It isn’t quite your typical ham-and-cheesy-potato meal, but it sure was good! The fellowship with each other was sweet, the glories of God’s creation were clearly evident, and the joy of Jesus Christ’s resurrection from the dead was vibrant in all our hearts. We appreciated our time to regroup and decompress, and can’t wait till our next trip up there! Blessings and Joy in the Journey!